The first type of metal blades used in weapons by the Native Americans was copper. The use of copper was restricted to the tribes who lived in the areas in which copper was a natural resource. Large deposits of copper were found in the Mississippi Valley region and around the Great Lakes and the Northwest coastal Indians, however, there is evidence that copper was also used for metal blades in weapons in many other areas extending from Alaska in the far north and Florida in the far south. It is believed that the copper from these deposits were transported across North America. The glacial period of the Ice Age in the Great Lakes Region resulted in the scouring of the rock that held copper deposits exposing veins of native copper. Extensive amounts of copper pieces of all shapes and sizes were also freely deposited in the area due to the melting of the glaciers. This type of copper that is found in glacial gravel deposits, is known as "float copper". Copper nuggets from the " float copper" were hammered and shaped into metal blades used for weapons such as Spears, celts and knives. The copper metal blades were generally used for long weapons and were typically narrow and double-edged, imitating the styles and designs of the stone weapons. The copper metal blades had distinct disadvantages because the points and the edges of the copper metal blades became quickly blunted. The value of copper as metal blades was therefore limited but the copper metal itself was regarded as having magical powers and was viewed by some tribes as sacred and weapons with copper metal blades were considered a symbol of status and power owned by high ranking warriors. The number of copper metal blades for weapons increased when refined copper was introduced by the European traders. 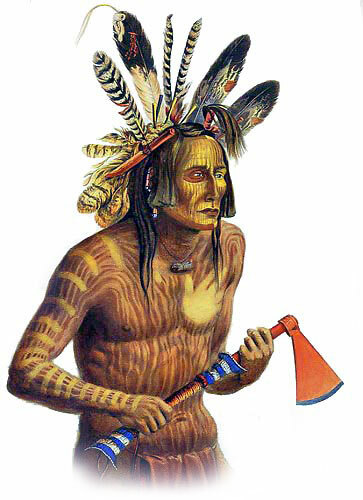 The Europeans also brought other metals to the Native Indians including iron, steel and brass. The limited number of iron metal blades used in the early manufacture of Native American weapons were made from iron meteorites. An iron meteorite consists of about 95% metal containing iron with some nickel and traces of cobalt. This type of iron was easy malleable and suited to cold hammering. Normally a high degree of temperature is required to melt iron making the process of making iron metal blades far more difficult. The iron metal blade was, however, highly desirable because it had a longer life and was easier to maintain than the traditional stone weapon. The number of weapons with iron metal blades did increase - the European traders started to trade weapons with metal blades for fur.